GB Railfreight has launched a dedicated rail services sector business that will support the train manufacturing and rolling stock operators. Already contracts have been won with Bombardier to move Class 720s between Derby Litchurch Lane and Old Dalby for testing, and then to Ilford for delivery. Three Class 47/7s bought from Colas Railfreight at the end of 2017 (47727/739/749) will be used by the new sector, with two recently modified at Eastleigh Works by Arlington Fleet Services (47739/749). They have been fitted with Dellner couplings to allow them to haul the new-build trains. GBRf will base the ‘47s’ at UK Rail Leasing’s Leicester facility, where the third (47727) will be modified. 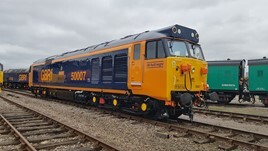 Speaking at the unveiling of two Class 50s painted in GBRf livery at Eastleigh on March 20, GBRf General Manager, Rail Services, Paul Taylor said: “These locomotives are being readied for deliveries of new trains to London and the South East starting shortly, and we expect them to be very busy and in demand. “We’ve also trained and recruited many additional staff - having locomotives to pull trains needs Train Managers to drive them! We’re putting around 70 new drivers through the school this year - not only that, but a number of new ground-staff members too, to ‘backfill’ where staff have been promoted to the footplate. We’re keen on having that progression."